What does “FR” mean for baseball gloves? “FR” stands for “Full Right” meaning the glove will go on your right hand which is ideal for left-handed throwers. Can I make a customized baseball glove? There is no option to customize a baseball glove at this time. What is the recommended inflation level for a basketball? Why should I not inflate a ball over the intended PSI? A manmade material that usually takes on the look and feel of real leather and requires little to no break-in period like real leather does. You break in a leather basketball by playing with it. There are no product or machinery needed. Skin, sweat, and simply playing with the basketball will break in the leather over time to the point where it is game ready. Does Spalding® offer a latex-free basketball? We do not offer a latex-free basketball. What does size 5, size 6, and size 7 mean in regards to basketballs and which one is best for me? What is the difference between the TF-1000 Classic and the TF-1000 Legacy? The TF-1000 Classic is built with a similar look and feel of past models and is made with a high durability standard. The TF-1000 Legacy adheres to current in-game demands with its advanced moisture management technology and is ideal for regulation game play at the high school and collegiate level rather than it being an everyday ball. How is a basketball made? Although we do it the best, the process of how a basketball is made is not SPALDING® exclusive information. You can find that information in articles and videos found on numerous websites if you do an internet search for that information. Can I make a customized basketball? There is no option to customize a single basketball. If you would like to place a large bulk order of a customized basketball or accessory, please view our SPALDING® Premiums (link to SPALDING® Premiums pdf file) catalog to see samples and get contact information for ordering. 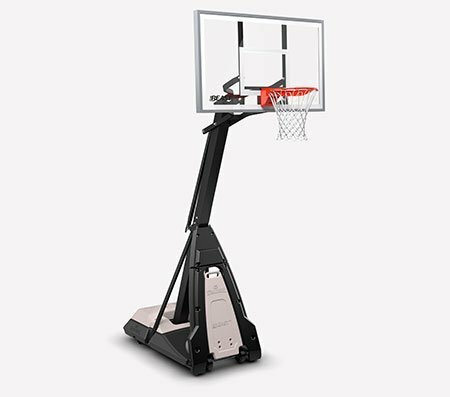 Do you recommend filling the base of a portable basketball system with sand or water? We recommend filling the base with either sand or water. If you are using sand, please refer to your owner’s manual for the proper amount to be used with your system. How do I find the model number of my SPALDING® basketball system? For help finding your systems model number, visit our interactive manual finder. In-ground – There is a three digit number on the front of the backboard, to the right of the rim. This set of numbers will identify your system. Do I need to bury my in-ground pole below the frost line? The hole depth shown in your owner’s manual is the minimum allowed. Depending on location, a deeper hole may be required. Consult your local building inspector and/or building codes for the depth of frost line. Please note a deeper hole requires additional concrete. Our tempered glass backboards come with preinstalled steel spacers and a foam pad. These are used to separate the rim from the glass backboard and prevent the backboard from shattering. You should have 1/8 to ¼ inch gap between the backboard and rim when properly installed. Some portables can be converted to an in-ground system depending on the mounting of the backboard. This would require purchasing an in-ground pole system. This is because in-ground systems and portable systems use different pole kits. The only parts you would use from the portable system would be the rim and backboard. To find out if your system can be converted, please call 1-800-558-5234 (M-F, 8-5:00 CST) with your model number and a representative will assist you. Can I convert an in-ground system to a portable? How do I take the poles apart? Where can I find net clips? Will your “break away” rims support a player hanging on the rim? This is specifically warned against in your manual and on your pole sticker. Do not hang on the rim or net. Our backboards and rims are not designed to support a player hanging from the rim or net. Failure to observe this warning may cause bodily injury and/or property damage. How can I winterize my basketball system? Where can I purchase non-toxic antifreeze? Your local hardware store should carry non-toxic antifreeze. Does the sand have to go inside the base or can I put weight on the top of the base? Can Spalding cover the cost of installation? How can I prevent my portable system from being blown over? If you are expecting inclement weather, place system in the storage position and/or in an area protected from the wind and free from personal property and/or overhead wires. The threads of my bolt will fit through the holes in my bracket but the non-threaded part will not, what should I do? 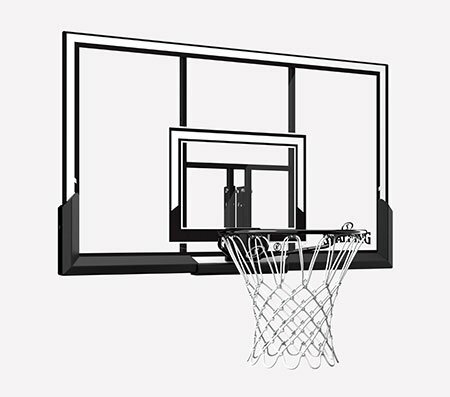 To ensure optimal play of the backboard system, a close tolerance fit between the elevator components and hardware is required. Test-fit large bolts into large holes of elevator tubes, backboard brackets, and triangle plates. Carefully rock them in a circular motion to ream out any excess paint from holes if necessary. 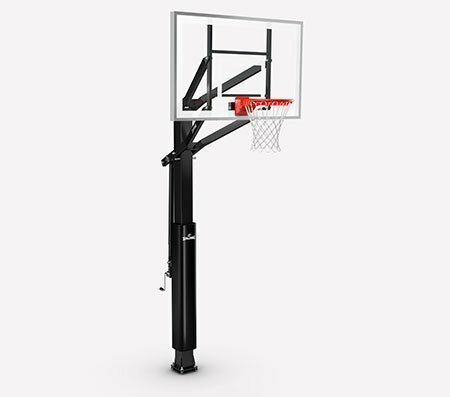 How can I fix my basketball goal or do I have to buy a new one? You do not necessarily have to buy a new basketball goal. Call us at 1-800-558-5234 (M-F, 8am -5:00pm CT) to order replacement parts for your basketball goal or to inquire about warranty coverage. How are footballs sized and which one is best for me? Full or Varsity is for ages 14 and up. Can one add air to a NEVERFLAT® ball? Yes. After one year, if your NEVERFLAT® is in need of air, simply remove the valve cover and inflate with a pump. Return the valve cover to the valve area after inflation. What is the recommended sizing and PSI (pounds per square inch) for soccer balls? What is the intended inflation level for a volleyball?